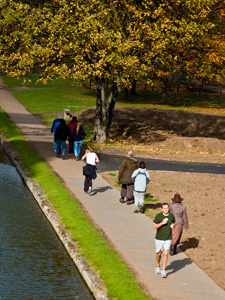 Walk East manages the Health Walks scheme in Tower Hamlets. There are over ten different walking groups, based at health centres and other community venues across the borough. Each group meets up weekly for a local walk of about an hour’s duration. Don’t worry if you’re a beginner – all levels of walking ability are welcome and there’s a good chance you’ll make new friends as you walk together. You can find a listing of the weekly walks and the organisers’ contact details here. It’s best to contact the relevant walk leader before your first walk, just to double-check the arrangements for meeting up. Planning a set of walk routes from your centre, so that you can offer variety and interest to your group. Creating walking maps, leaflets and other published formats, to help you share your walks in your outreach work. Support with marketing and PR, to promote your group and recruit new members. Extending the scope of your group, by organising guided walks, photo-walks or day trips to walks further afield. Providing links to other walking projects, festivals and resources that might be of interest. Arranging training for your walk leaders, whether volunteers or health trainers.